One of the nature’s many wonders is found at the Natural Bridge. The Wild & Scenic Rogue River disappears into a hole in volcanic rock, and emerges some 200ft downstream. I traveled there to take pictures and hike the wonderful easy trails. This picture below is the bridge that leads to Prospect after Union Creek. The Avenue of the Boulders is located on Mill Creek Drive, the scenic road that parallels Hwy 62 into the quaint town of prospect. 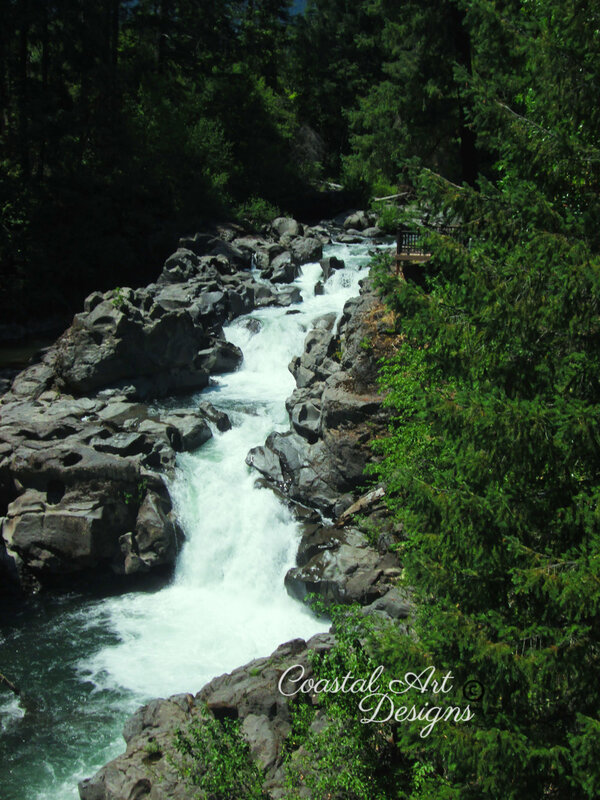 At this location the Rogue River drops 75ft and creates truly spectacular water scenery as the water flows down and around these magnificent boulders. The picture below I took from the bridge off to the right side as I jumped out quickly to avoid any cars to hit ours. We literally stopped in the road. This is the image at the natural bridges that shows exactly how the way the Rogue River runs through this lava made formation. I thought it would best be shown as an image then to explain it. Let me also say some call it a waterfall but in the State of Oregon it is not consider a waterfall and is not listed in the government directory. 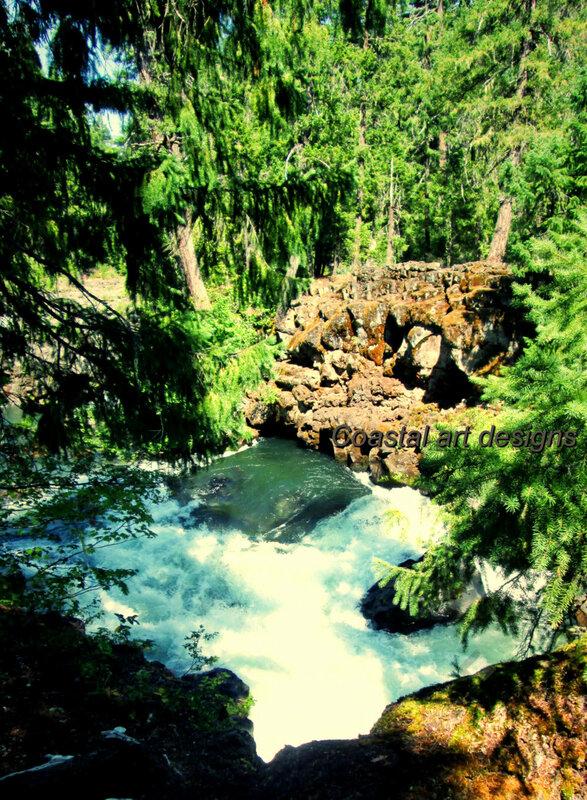 Living in Oregon I love it and to share with everyone the beauty and natural places through my photography. My mom wanted to go hiking or see the sights not sure which but she wanted out of the house. How fun is it to go an hour east or north etc and you get to see all this beautiful places. This particular day was very sunny and my photos were taken at angles that limit me to try and get the best angle from where I was. Sadly I didn’t get the best but only a few. As you walk along the pathway over the right side you can see this view and I’m not sure how to get there or if you can. I thought it would be better to show you the illustration that was at the Natural Bridges to have a better idea. Now from all the pictures I took only a few were ok to post. It’s so hard to believe when you are standing above the inlet and watch the Rogue River vanish. The river actually flows into an ancient lava tube, or a natural bridge, taking some 35 seconds to travel 200ft to reach the tube’s outlet. These small openings hint of the turbulent nature of hidden river below. At its peak, approximately 335,000 gallons of water rush from the Natural Bridge each minute at a speed of 6ft per second. Not only it’s fast, but also very cold. As you can see this is where the Cave so it’s called is a side of one way to see it. If you see the wooden post across the end of the picture then you’ll see how hard it is to move in a good spot without shadows even with my flash on. Trying to save some of the pictures, I used some filters and effects to hope it would be an improvement. I guess it’s just not the day for capturing the beauty of it.